The traditional use of this plant was for the skin and female reproductive organs such as the uterus and ovaries. Due to its earthy and somewhat wet, soil-like smell, which resembles the smell of moss, it is also used in aromatherapy as a sedative and calming agent. This plant is very famous on the Indian Subcontinent by the name of Jatamansi and is widely used in herbal medicines. Several herbal, medicinal preparations based on this plant can be found on the market, particularly in India and a few of its neighboring countries. This plant is native to Nepal and is called Nardostachys Jatamansi in botanical terminology. Blends with - Clary sage, lavender, lemon, neroli, patchouli and vetiver. Constituents - bornyl acetate, valeranone, jonon, tetramenthyloxatricylodecanol, menthylthymyl-ether and 1,8-cineol. Benefits : Spikenard essential oil can be beneficiary in promotes secretion of hormones like estrogen, provide relief from insomnia and stress, aids in curing constipation, effective remedy for bacterial and fungal skin infections and gives relief from various type of inflammation. 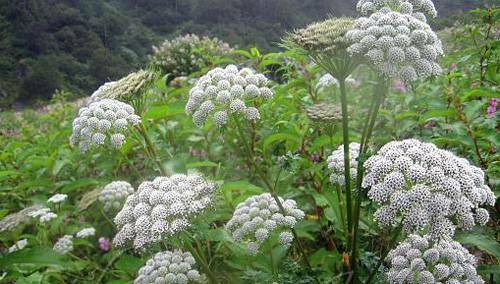 Use of spikenard essential oil- Spikenard oil is widely used in the field of medicine. It is an effective cure against the ills of migraine, weak nervous system, tension, stress, indigestion and insomnia.